Holidays in Soiano del Lago ↔ Discover Lake Garda! Soiano at Lake Garda is a haven of peace and a golfer's paradise. Soiano del Lago is a municipality of about 1,500 residents, located west of the coastal road Gardesana Occidentale at 196 metres above sea level. As this is a rather small village, it is ideal for those who want to spend a few days away from the crowded tourist centres. If you're going to plunge back into the busyness, you can easily reach the lively resorts of Manerba and Moniga, San Felice del Benaco or Desenzano. Soiano del Lago is well known to the golfing community. After all, there are some excellent, well-designed golf courses here. The local golf club is one of the most prestigious and most significant in Italy. Therefore, many hotels and guesthouses in the area offer special golfing holiday packages. In addition to golf, there are many other recreational opportunities in Soiano. While passionate water sports fans go surfing, others spend the day hiking or mountain biking. For those who love culture, you can visit the castles of Soiano or Manerba, and for fine food connoisseurs, you can enjoy some first class wine tasting, excellent olive oils and many other delicacies served in the local inns and taverns. The baroque church dates back to the 16th century. Inside, there is a remarkable representation of the Annunciation, paintings by the artists Celesti and Bertanza and a magnificent, also baroque organ by Antonio Franchino Montechiaro, richly decorated with gilded wood carvings. The castle of Soiano was built in the 12th century and is accessible via many steps and a drawbridge, which used to be the only access. In summer, the castle ruins serve as an atmospheric backdrop for many music and theatre events. 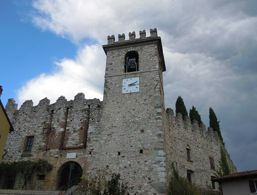 The mighty tower, formerly the watchtower of the fortress, now functions as the belfry of the parish church. In the hamlet of Chizzoline, there is another beautiful 17th-century church dedicated to San Carlo. The accommodations at Soiano del Lago were rated 4.5 out of 5 stars by 14 users.